The lineup for the spin-off series of the hit drama "IRIS'' has been revealed. Titled "ATHENA,'' the highly anticipated drama will feature some of Korea's top stars and another thrilling tale of terrorism, spies and secret agents, similar to the original but with a twist. 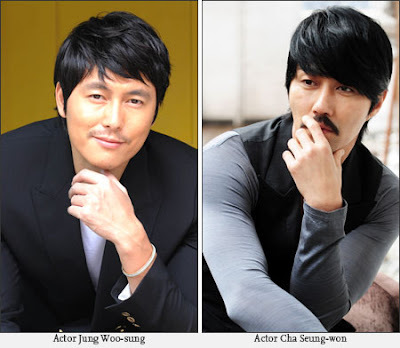 Jung Woo-sung, 36, who is returning to the small screen after 15 years, will appear as Lee Jeong-woo, a secret agent who gets tangled up in a conspiracy that threatens the safety of the Korean Peninsula. Taewon Entertainment, the production company, explained that the character holds all the characteristics and abilities that are found in Lee Hyun-jun, the protagonist of "IRIS,'' with the charm and charisma of James Bond. Lee's nemesis, Son Hyeok, the ruthless leader of the terrorist group ATHENA, will be played by model-turned-actor Cha Seung-won. The merciless role will hopefully bring out the charisma and brutality hidden beneath the 39-year-old Cha's comical and likable character he is famous for, according to Taewon Entertainment. Filming will begin in June in Italy or Switzerland. The shooting will continue in six other countries, including Singapore and New Zealand, following the footsteps of "IRIS,'' which was filmed around the world as well. "ATHENA'' is scheduled to be aired late this year. "IRIS'' aired last year with high expectations thanks to its star-studded cast, dramatic storyline and cinematic action scenes. Starring Lee Byung-hun and Kim Tae-hee, the soap took local dramas to a whole new level, garnering both male and female fans here and abroad with its distinctive story involving secret agents, South and North Korea, and betrayal.